If you’re already arranged a cruise for this summer or fall—or are thinking about a cruise—you’ll be enjoying a good travel value. Prices for cruises, especially for departures within a month, remain low. In fact, base cabin rates on the mass market lines are low enough to pressure those lines into trying to fatten their thin margins by markups on just about everything they can. And getting a good deal on the cabin doesn’t mean you won’t be overcharged for something else. Find a local sightseeing tour after you hit land (for less than the cruise line charges)—you’ll find them at most ports. Pre-arrange an independent excursion through an online agency. Among the ones I know are Port Promotions, Port Compass, PortSide Tours (866-731-7193), Shore Excursions Group (866-999-6590), ShoreTrips (888-355-0220), and Viator. Hire a local cabdriver to take you around the area, going where you want to go and avoiding the tourist traps. Rent a car for a day—many rental companies either have port offices or meet ships. Use local public transportation or just walk—at many stops, the main attractions are close to the port. Your choice depends on where you are and what your interests are. On a Mediterranean cruise, for example, most ports enjoy easy access to local public transport. In the Caribbean, a taxi tour is probably a better bet. In Juneau or Anchorage, think first about renting a car. Your choice also depends on your travel party: Taxis and rental cars work out best when three or four people share the cost. 2. Shopping. Ignore the port lecturers’ shopping recommendations. There’s a good chance that any port lecturer’s shopping recommendation is a paid commercial announcement rather than good-faith consumer advice. Avoid the tourist traps where the official tour stops for the same reason. A good rule of thumb: Any time you see an opportunity for a kickback, there’s a kickback. And think carefully about what to buy. Even though shopping seems to be a popular port activity, my experience is that there’s hardly anything you might buy in a cruise port—which you really want to keep—that you can’t buy, for less money, at a discount store at home, without the schlepping. Research each port for any really good local deals; stick to those items and forget the straw baskets. Port homework is easy these days. Start with one or two current cruise guidebooks: Both Fodor’s and Frommer’s publish them for the main cruising areas. Other publishers offer more specialized cruise guides—browse Amazon.com or a local travel bookstore. 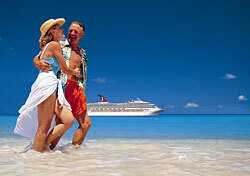 And such online forums as SmarterTravel’s sister site, Cruise Critic and Cruise Reviews have lots of port information. A few dollars spent on those books—and a few hours spent online—will pay big dividends after you set sail. What are your recommendations for avoiding cruise port rip-offs? Share your thoughts, experiences, and advice by submitting a comment below!